It has long been forbidden for men to weave in the Chilkat tradition, but Tlingit artist Ricky Tagaban is an exception. Using techniques practiced for thousands of years, Tagaban creates his trademark iPhone bags, hair clips, and head bands, putting a modern spin on an ancient tradition. In his living room overlooking the Gastineau Channel in Juneau, Ricky Tagaban is spinning wool and wet cedar bark together on moose hide. The process joins the fibers together creating something called warp which will give Tagaban’s bags their structure. With the big Celebration cultural event just a few days away, Tagaban still has several commissions left to fulfil. Though his finished pieces vary in size and intricacy, they all begin the same way – as cedar bark softening in a crockpot. 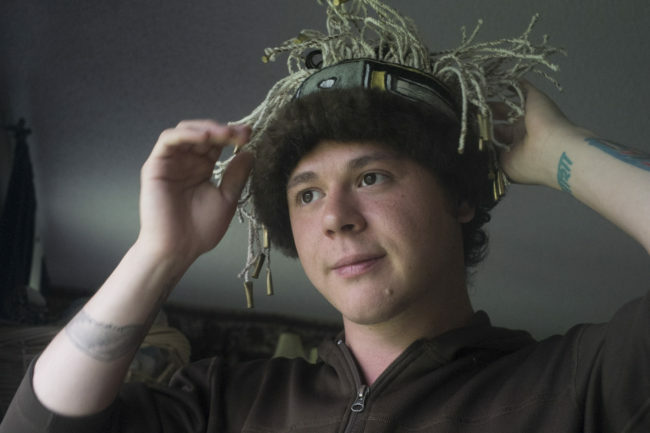 Tagaban is weaving in the Chilkat tradition. 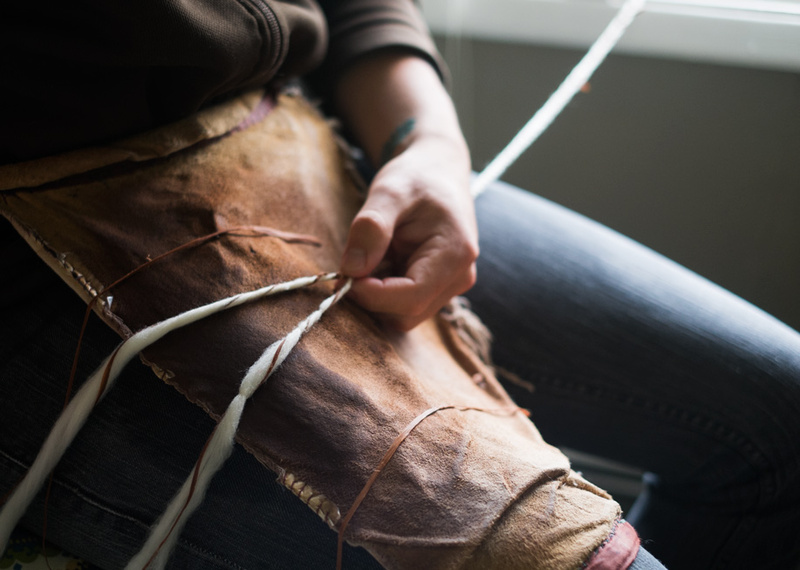 The textile technique is passed down through Tlingit, Haida, and Tsimshian families and there are strict rules guiding its practice. Created on an upright loom, Chilkat use abstract shapes and patterns inspired by nature. Much of what’s known about Chilkat came from the late master weaver Jennie Thlunaut. Juneau weaver Lily Hudson Hope has been practicing both Ravenstail and later Chilkat weaving since she was a teenager. “I feel that the traditions and the rules and taboos are set there, and they’re there to protect us,” Hope says. 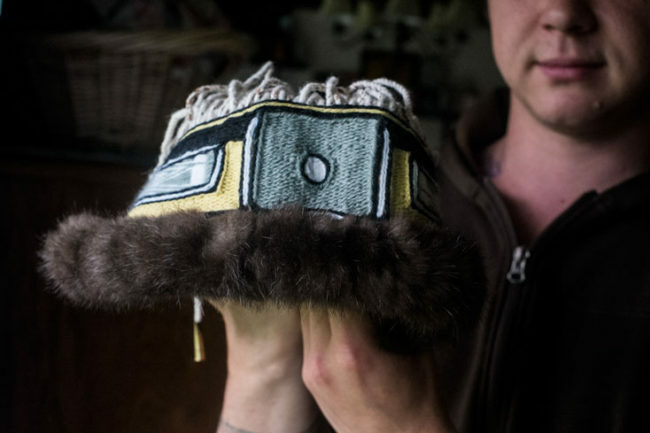 One of the taboos in Chilkat is to never place a human hand in designs. Another is to always cover up your work after you’re finished. The one that applies to Tagaban is that men can’t weave. But Hope says there is one exception. By two spirited, Hope means gay. In the summer of 2010 Tagaban was invited to learn from Thlunaut’s apprentice and Hope’s mother, Clarissa Rizal because he fit the tradition, and was identified as someone who could carry it forward. really identifying as a weaver had really reconciled my Nativeness and my gayness,” Tagaban says. Since learning Chilkat, Tagaban’s works have become more elaborate and experimental, incorporating more modern materials like shot gun shells. This spring Tagaban was awarded his second Rasmuson grant and one of his iPhone bags appeared on the Red Carpet in Los Angeles at the GLAAD Media awards. Hope thinks it’s exciting to see the way Tagaban has brought Chilkat to new audiences. Back at Tagaban’s home studio, he lets me try on a pair of leggings decorated by deer hooves. They’re a work in progress, an old world object with a twist. 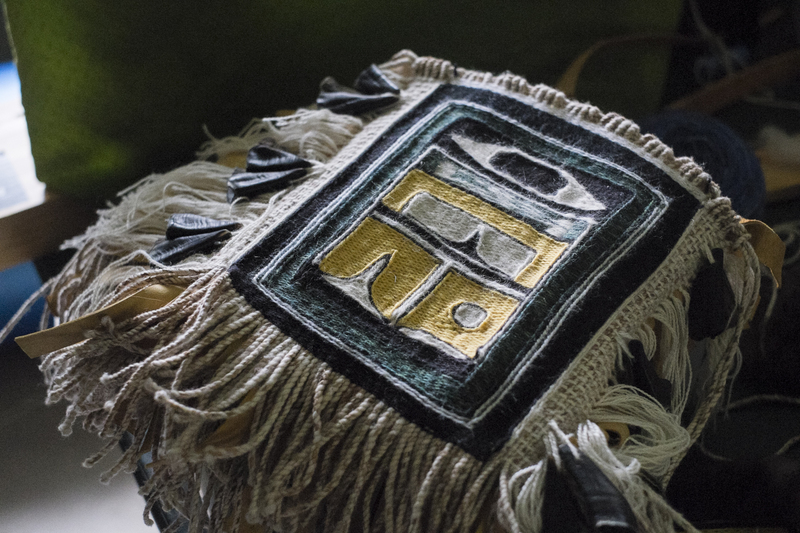 Embedded in the traditional Chilkat pattern is a small patch of geometric Ravenstail weaving, a hybrid design that’s beginning to gain acceptance in Chilkat weaving. For Tagaban, harmonizing both aspects, the modern and traditional is important. The leggings are almost finished. Tagaban just has to sew sea otter fur to the tops before he can see them on a dancer at Celebration.